The Turkish parliament has begun the process of electing a new president, in what is already proving a highly controversial contest. More than 300,000 people took to the streets of the capital at the weekend to pressure Prime Minister Recep Tayyip Erdogan not to stand. His opponents accuse him of having an Islamic agenda - a charge he denies. 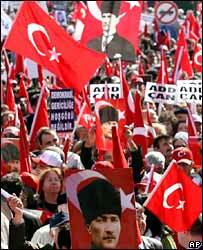 Turkey has been a republic since 1923, with a strict separation of religion and the state. 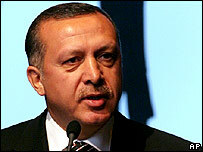 Mr Erdogan is now under intense pressure not to run for president. The protest on Saturday was the biggest here for many years. Police say at least 370,000 people turned out. They chanted: "Turkey is secular and will stay that way!" The prime minister and his party have their roots in political Islam. If he is elected president, his wife would be Turkey's first-ever First Lady to wear the Islamic headscarf. That is a deeply divisive symbol here. Last week, Turkey's most senior general warned that the next president must be wholeheartedly loyal to the secular system - a thinly veiled warning to Mr Erdogan. The prime minister has said he has no intention of pushing a pro-Islamic agenda. There is very little evidence to suggest otherwise, but the country's powerful elite just does not trust him. The president here has a veto on all laws and appoints many senior figures within the establishment. With a large majority in parliament too, in theory Mr Erdogan would have the power to try to transform the republic. The prime minister is the country's most popular politician and has the full support of his party to become president. Many people though warn that could spark further tension here. They are pushing him to nominate a compromise candidate in his place.